Dyeing with indigo can be traced as far back as 7000 BC, and is still widespread even today. This form of dyeing, using various plant species, is practiced in many parts of the world such as Mexico, Europe, Egypt, West Africa, Sumatra, Central Asia, Japan, the Americas, and China) Ancient Britons and other Europeans originally obtained the dye from Isatis tinctoria (woad) but later Indigofera from India and other Eastern countries was used. 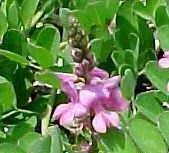 Indigofera tinctoria is native to India and Africa, while Indigofera anil of Central and South America and I. suffructicosa are native tropical American species adopted in Africa. Indigo is a vat dye (CI. Vat Blue 1), produced without mordants by a process consisting of a complex series of chemical reactions for the dye to be successful, thus a lot of care and patience is required. It shows fastness to light and water, is insoluble, and will dye all types of fibers. Today, synthetic indigo used to dye blue jeans has almost totally replaced natural dye in most societies. This is because synthetic indigo is cheaper to produce and more uniform in concentration than natural indigo. Natural indigo tends to be used today primarily by artists and craftsmen producing specialty products, and by those dyers involved in textile conservation or historical recreation. They are also used on ceremonial occasions, notably wed dings and funerals, and in traditional medicine. These days some add a few crystals of synthetic indigo to the final dye in order to darken the hue. Indigo dyeing using the plant species Lonchocarpus cyanescens or Indigofera suffruticosa, or other Lonchocarpus and Indigoferra species, such as I. tinctoria and I. arrecta (all of which grow wild), were the most common and popular sources of color throughout West Africa. Both Anglophone and Francophone countries were quite active in this indigenous technology; e.g., Mali, Nigeria, Senegal, Guinea, Gambia, Liberia, and Ivory Coast. Research on excavations from caves in Mali has shown that the indigo dyed cotton garments dated between the 11th and the 16th centuries, indicating that by the 11th century weaving and indigo dyeing had already reached a high standard in West Africa. Many of the tie. dye de signs found are similar to those still in use today. Though the process is quite arduous, it provided a rich color usually missing in synthetically dyed fabric. The basic methods of dye production are quite similar throughout the West Coast of Africa with some variation. In the present study, however, the process of indigo dyeing was investigated, since only scattered information is available on this intricate and rap idly dying art in Sierra Leone. It was important that we document what remains of the technology before it completely disappears. The investigation involved both field interviews of experienced dyers and a review of the literature on the history, methodology and chemistry of indigo production, and the methods of dyeing fabric with indigo in Sierra Leone. The art of tie and dye using natural dyes is believed to have been practiced in almost every country in the world, including African countries. It is thought that the Madingoes and the Susus who migrated from Guinea between 1820 and 1920 and settled in the North and Northwest of Sierra Leone especially in Makeni, the capital of the Northern Province of Sierra Leone, brought the art of “gara” dyeing with them. This is partly the reason for the concentration of the trade in this part of the country.